The Kentucky National Jersey show and sale will be taking place today, with the show beginning at 1:00 p.m. and the sale at 3:00 p.m. (EDT). Class winners and champions from the show will be posted here as soon as possible, so check back frequently for results! To get a preview, if you haven’t already seen them, view the consignments HERE. 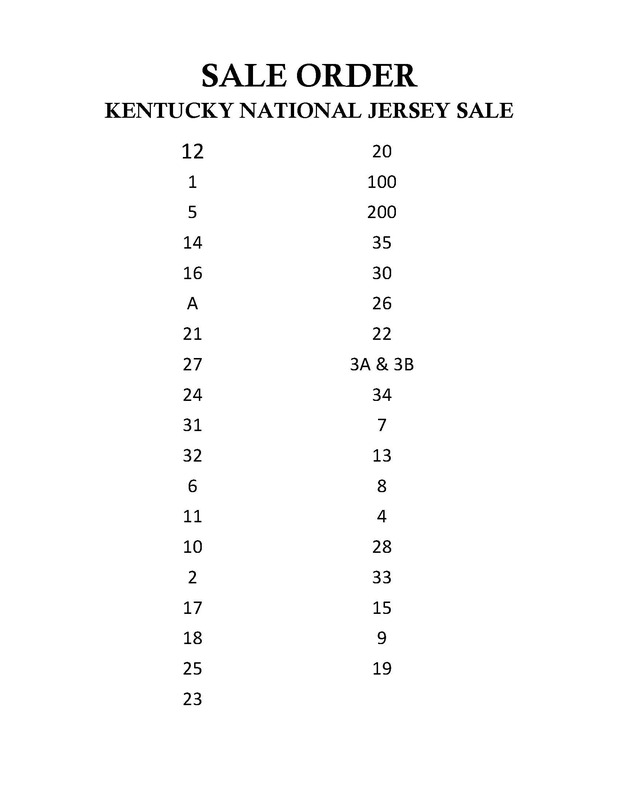 The Kentucky National Jersey Sale will be held on THURSDAY, April 4, 2019 in New Market Hall at the Kentucky Fair & Expo Center. The sale cattle first compete against each other in a show at 1:00 p.m. (EDT), with the sale directly after at 3:00 p.m.
Lots A (Lot A Choice List), Lot 100 A-E and Lot 200 A-E are selling virtual. Lots 100 and 200 are available for pre-sale bidding on www.jerseybid.com, and will have final bidding as part of the live sale. The sale will be broadcast LIVE on www.jerseyauctionlive.com on Thursday afternoon. Clay Hill Jerseys will be completely dispersing on Saturday, April 13 at 11:00 a.m. (CDT). James Arnold is a lifetime breeder and has supported the Kentucky National Sale series and sold to other Jersey enthusiasts over the years. The cattle have gone on to do well for their new owners. Strong and productive can describe the breeding behind these Jerseys. Directions: Farm is located off of I-64 at Exit 18. Take Frontage Rd. (at Motomart), west 1.3 miles to the stop. Turn left. Follow the blacktop road (through curves) 2.8 miles. Turn right. The farm is .5 miles ahead on the right. More to come from the farm, including many pictures of the consignments selling. There are March 2019 calves up to older cows with proven longevity. Add production and different breeding into your herds on April 13. The sale will be at the farm in Poseyville, Ind., and will be online for live broadcast and bidding at www.jerseyauctionlive.com. Jersey Marketing Service is working with the Buckeye Dairy Club to sell 20 lots of Jerseys as part of their Buckeye Classic Sale series at Spring Dairy Expo in Columbus, Ohio. The sale will begin at NOON on Thursday, March 28 and will also be able for LIVE broadcast and bidding through www.jerseyauctionlive.com. Pictures of the consignments are below. Two cows, Lots 16 and 20, will be pictured at evening chores to show udder quality.